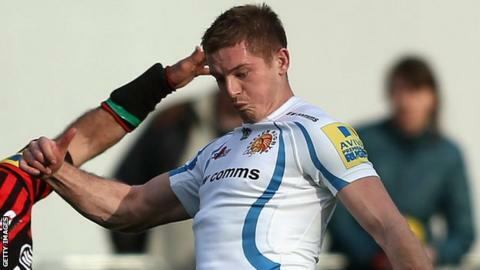 Steenson kicked 17 points and created Damian Welch's try as Exeter became the first side to do a Premiership double over Quins this season. "He's playing very well for us and thoroughly deserves the accolades he'll get," Baxter told BBC Radio Devon. "Not only did he make those breaks and show a cutting edge, but tactically he kicked very well." The frustration is if you can do it to Harlequins, why can't you do it to a few more people? The Irishman has started every Premiership and Heineken Cup game for Exeter since winning his place back from Ignacio Mieres in October. And while the to try and get more games, Baxter feels Steenson has gone from strength-to-strength. "Occasionally people come to me and they criticise that's he only a kicker and nothing else," Baxter said after the game. "Well, he was far from that today. "I'm a massive believer that people get better and guys improve with Premiership exposure. "Steeno's had a good run now - he's having a run of games and that's what fly-halves need. "He's kicking well, and he's looking more and more comfortable and content out there all the time. But he's working very hard, he's a professional guy and it means a lot to him." After beating Harlequins, who are currently second in the Premiership, four points behind leaders Saracens, Baxter admitted he is annoyed that his side have not been able to perform as well in some of their other league matches. Before Exeter had gone five Premiership games without a victory. "We always feel we're quite a good attacking side and that we're well-structured and create opportunities," he added. "But sometimes we don't have an edge about us, but today we had it all. "We controlled a lot of the momentum of the game and ultimately we came out on top because of that. "The frustration is if you can do it to Harlequins why can't you do it to a few more people? We've got to do it against some other teams as well."